We are now in our 5th season of making our re-souL collection shoes. A house brand with the intent of bringing you fashionable, handmade, comfortable shoes. For this Fall/Winter season, we focused on updating some of the basics you might find in your in your closet in the need of freshening up. A basic pump to wear to work does not have to be boring. We have two styles we think you will find very versatile. An 80’s inspired pump with a choked up vamp that will look great with dresses as well as jumpsuits. Another style is a dressier version of a shootie that can be worn dressed up with tights or with your favorite jeans. If you haven’t seen it already, which we are sure you have, a simple blocky heel boot is the latest rage in ankle boots. We love the Go-Go boot feel of both of these re-souL boots. Again, super versatile and comfortable to walk in all day long. Pointed toe flats have been around for a while. But if you haven’t dived into this trend yet, you may want to give it a go. 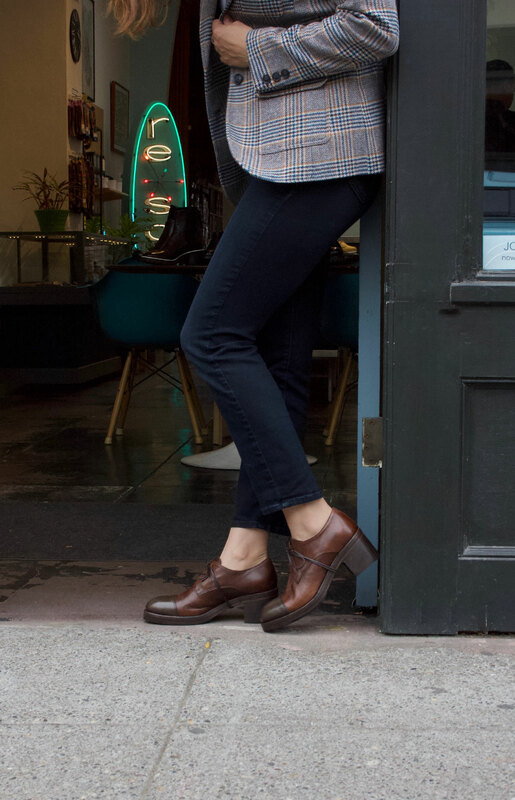 Bridging the gap of feminine and masculine, you cannot go wrong with either the lace-up oxfords or the simple “Beatle” boots.